Hasn’t it happened to all of us at some point of time…that we want affordable designer labels, but the budget is like sky high. While many of us may save up after losing a hand and a leg to grab that perfect wedding or pre-wedding lehenga. Most of the times, its just too much for that one outfit. Somewhere that doubt always exists in the back of our minds. I am usually not a designer freak, my own wedding lehenga cost me less than what pre-wedding lehengas cost. But that’s me. I know a lot of my friends, colleagues who go ga-ga about scoring that one Sabyasachi outfit, or a Tarun Tahiliani dream wedding lehenga. Sometimes it doesn’t work out. But does that mean the dream of affordable designer labels has to end? I have been following up on fashion shows ever since I started the blog, and one thing that has come out is that there are a lot of (good) affordable designer labels out there who may not be all that social media popular. May be, they might not be the names at the tip of your tongues. But these affordable designer labels create some stunning pieces nevertheless. Sequins, gota patti, mirror work in bright summer colors…what more can you ask for. If you’re really in the mood to invest in affordable designer labels without making a significant hole in your pocket…then you must give Abhinav Mishra collection a good look. You might find some awesome pieces at the best designer price possible. Abhinav Mishra lehengas are not to bridal like. 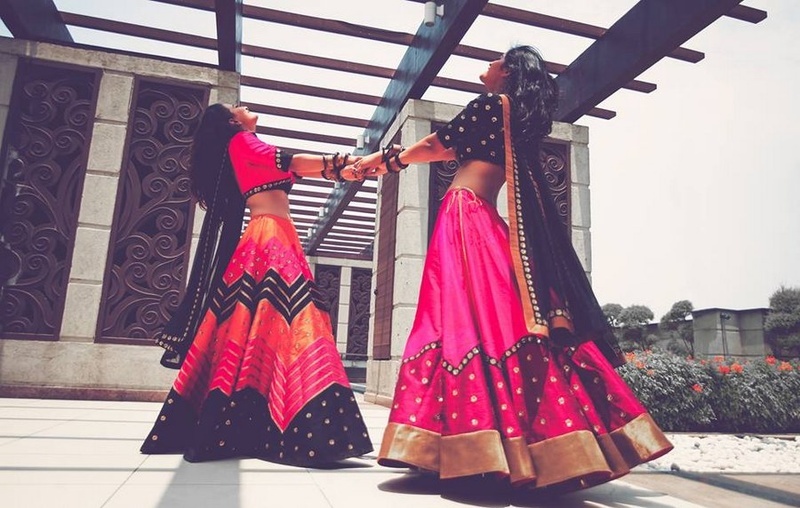 But Abhinav Mishra Lehengas are perfect for the sister of the bride look, or even for small pre-wedding function look. I love the fact that these looks can easily be re-used in others weddings without looking too heavy or blingy. In case, you wish to go ahead with one of these for your functions, accessorize well and you will make for one stunning bride-to-be. NOTE: Pernia’s Pop Up Shop is currently giving these outfits at flat 20% off ! If you’re into quirky style, then Priyal Prakash is the way to go. I love how the designer plays with shades of colors and geometry that too in ethnic wear. Hers is a super chic collection where guaranteed you will find something that you will instantly fall in love with. My personal favorites are the ones where black is mixed with bright pop of colors. She is the young, vivacious talented designer who became overnight famous for her mirror work heavy blouses and ethnic tops. Every celebrity from Malaika Arora Khan to Karisma Kapoor were seen wearing her creations. In fact the first image – the mint green lehenga is sort of one of the most re-pinned lehengas on my pinterest page. Now we know what the lehenga prices are. Her collection definitely has a lot more to offer, but I just found these which were worthy of a mention. If you like her style, you can contact her from the below given address. I have been in awe of Ridhi Mehra ever since her last years collection at Lakme Fashion Week. Her style is perfect for those looking for a contemporary modern twist to the Indian Ethnic outfit. If you’re not too much about the bling, and like subtle gorgeousness then her collection may be of interest to you. Remember Shilpa Shetty wearing her creation in last years Lakme Fashion Week? Her collection was one of the most talked about shows for quite some time, and now you know exactly how much a Divya Reddy outfit can cost. Beautiful sea green and blue colors, the outfits are perfect for sangeet mehendi look. Which affordable designer labels is your favorite from this list?